I'm a big fan of nature photography, the closeness to the animals and the impressive landscapes always have me in awe of the beauty we have on this planet. 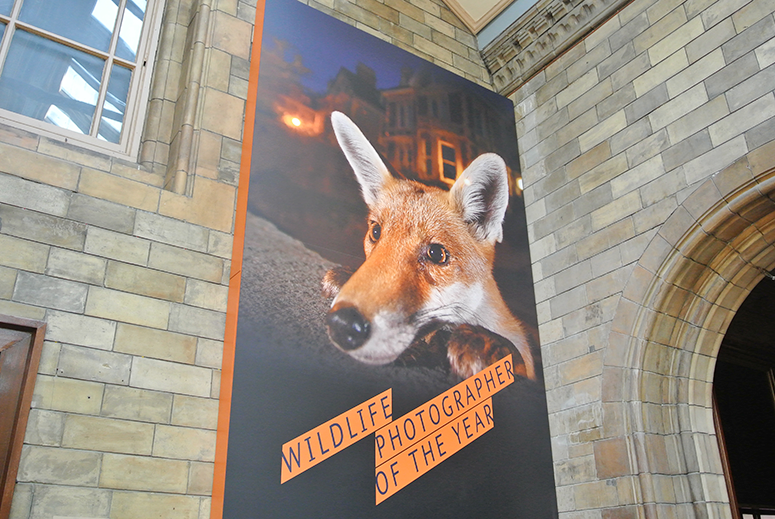 And the annual Wildlife Photographer of the Year exhibition at the Natural History Museum is one of my favourite staples on the cultural calendar. Now in its 33rd year, out of all the times I've had the pleasure to visit this exhibit, the 2017 edition was the best one yet. This year the competition to be the Wildlife Photographer of the Year was the most popular in its history, attracting almost 50,000 entries from 95 countries. Needless to say, the 100 entries that made it onto the walls of the Natural History Museum are extra-ordinary; they are the very best of the best, showing the natural world in all its horror and beauty, often side by side. They're vivid, evocative, and really do make you appreciate the natural wonders we're surrounded by. We might not always notice them in our day-to-day lives, but seeing these snapshots through someone else's camera creates a unique insight into the world. Like previous years, the exhibition is broken up in clear category sections, each with its own winners and finalists. They are First Shoots (young photographers until 17 years old), Earth's Diversity (broken up into Mammals, Birds, Reptiles/Amphibians/Fish, Invertebrates, and Plants), Earth's Environments (Under Water, Urban, and Land), Documentary, Earth's Design (Details, Impressions, and Black & White), and Winners. Having the photography grouped in categories like this makes the vast selection and diversity of the images seem more coherent and allows the viewers to focus on each one, rather than feel overwhelmed. Each category has some astonishing imagery but there are a few in particular that stood out to me. 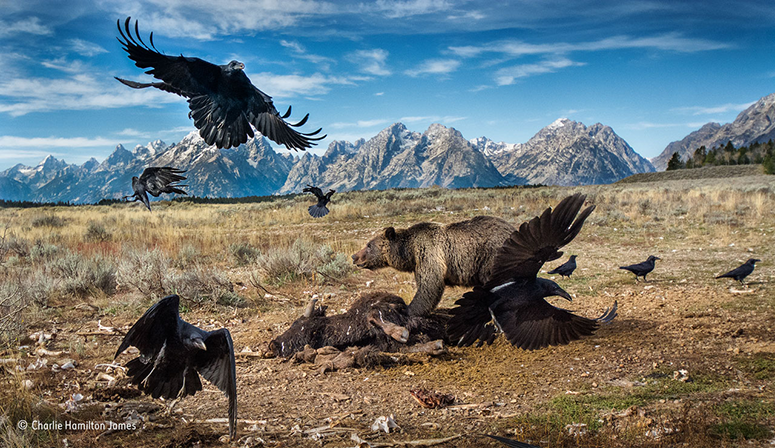 The Wild West Stand-Off by Charlie Hamilton James from the UK and taken in Wyoming, USA, shows the natural brutality of the food chain as a grizzly bear dives into a carcass while vultures fly around, also trying to get close to the meat. What astonished me most about this picture was the backstory. Charlie put a camera trap in the location for almost 6 months and captured 200,000 photos in that time. Right next to the grizzly bear was the far more serene A Sporting Shot by Andrew Parkinson, also from the UK. He captured three curious hares in a field of clear white ice. The pure white snow and clear blue sky provided a vast contrast to the environments surrounding this photo. Also in this section I loved Dawn of the Bison by fellow Dutchman Jasper Doest, who captured bison in Kraansvlak Park that were surrounded by midges. With the first ray of light bouncing off the insects, the photo had an ethereal quality, as it looked like fairies were surrounding the animals. Moving onto ocean creatures, The Dying of the Light by Angel Fitor (Spain) was wondrous. Depicting a lone jelly in the water at sunset, with the peaks of mountains or an island poking out in the background this was another mystical photograph. In the plants section there were quite a few that caught my eye, especially Grass at Sunrise by Robero Bueno (Spain) and Little Star by Stefano Bagloni (Italy). The first was another one that looked so very magical (honestly, many photographs this year could've come straight out of fairy tales) with its romantic pastel colours and delicate focus on the pink grass. The latter, was in stark contrast with pointy, sharp angles and an overwhelming amount of greys - and yet it was equally fascinating as it depicted a young bishop cap's cactus in the Chihuahuan Desert, covered in tiny scales to protect itself from the sun. First Shoots is always one of my favourite categories as I'm never not impressed by the quality and uniqueness of the images from these very young photographers. This year my eyes were instantly drawn to two birds: A Delicate Balance by Carlos Perez Naval (Spain) showing a chiffcaff delicately balancing on a reed, and Thistle-Plucker by Isaac Aylward (UK, but taken in Bulagria) showing a linnet bird on a thistle. One other one I absolutely adored was the cute sea lion in Sand Napping by Deston Wernicke (USA, photo taken in the Galapagos Islands). As he lazily lifts his head slightly to look at the camera, half his face is covered in sand and tiny rocks and he looks adorable. Earth's Environments is a category that is wildly impressive for its sheer diversity of geographical focuses, from erupting volcanoes to a red fox leaning over a brick wall in the urban environment of Bristol, it shows the incredible range of places we have in the world. However, the last category I want to stand still by before talking about the winner is Earth's Design, which was such a cool section; arty in style. From extreme close-ups of an animal's face, depicting each layer in detail, through to a beautiful selection of black and white imagery that looked straight out of a magical world. My favourites here were Fairy Tale Forest by Agorastos Papatsanis (Greece), which shows mushrooms with just two in focus, inviting the viewer to wander in, and Requiem for an Owl by Mats Andersson (Sweden), showing a melancholic image of a pygmy owl that just lost its partner. Not only that, but the owl in the photo died a few days later too – heartbreaking. Last, but certainly not least, was the winners' section showing both the Young Wildlife Photographer of the Year 2016 and the Wildlife Photographer of the Year 2016. 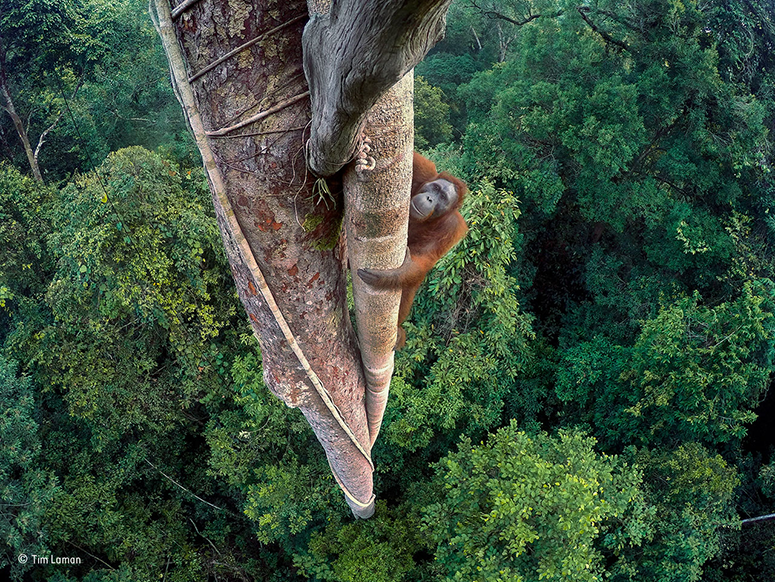 Here, I was instantly pulled in by the dizzying heights of Entwined Lives by Tim Laman (USA, but taken in Borneo). Tim installed GoPro cameras high in the forest canopy, which he triggered remotely from the ground floor to capture an orange-utan climbing higher and higher. The perspective in this photo is incredible and the tree seems to go on forever. The diversity of location, style and subjects makes The Wildlife Photographer of the Year exhibit a constantly exciting discovery. Not only that but the captions below the photos provide fascinating insights behind the captures, showing the sheer perseverance and technical capabilities many of the photographers put into action to get that one winning shot. And in addition to information about the image and photographer, there are also other super interesting tid bits about the natural world highlighted; from barn owls having the most sensitive hearing of any animal tested through to the fact that grasslands are one of the biggest ecosystems on earth with nearly 12,000 species covering 52.5 square km globally. So not only are the photos wildly impressive, the exhibition is educational too – for children and adults alike. The Wildlife Photographer of the Year exhibition at the Natural History Museum in London is booking until 10 September 2017. Buy your tickets here.